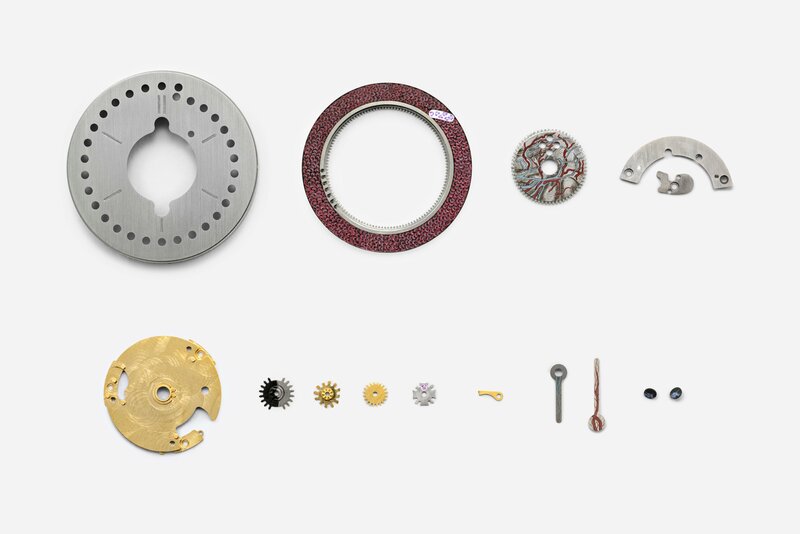 This is the story of the – as of now – most intricate ochs und junior watch that we have ever manufactured for a client. It is a story about team work, about the skill and talent of individual specialists, and it is the story of the very unusual life that this perpetual calendar has come to represent. The story that connects us to the owner of this watch started on July 2, 2017. On that day, we received an email from Silicon Valley in Northern California. A watch lover wrote to let us know how fascinating and elegant he thought the products and the concept of ochs und junior were. He explained that as a watch aficionado who had, until now, favored traditional brands, he was ready now to take the next step. He and his wife had already spent time on the Customizer for a perpetual calendar, and they wanted to know if it was possible for us to take the concept for bespoke watches even further. This launched a project that we finally completed on March 28, 2018 – the day our Californian customer left our workshop with a perpetual calendar, an extremely personal watch that he had assembled himself, on his wrist and a satisfied smile on his lips. But let’s go back to the beginning: We answered the email from Northern California with a detailed description of our possibilities and named the two things we were not willing to do: any writing on the dial or a transparent case back. We asked for a phone call in order to understand his basic idea and to ask a few precise questions ourselves. The client at the other end of the line turned out to be working in the health industry, investing in medical technology. He had just recently had a bone marrow transplant – a life-changing event that he wanted to have represented in his personal perpetual calendar. The basic direction for the watch, the goal for its presence on the wrist, the materials to be used and further details were discussed and fixed in a one-hour phone call. The design process was to be part of this project and the client wanted to be very much involved in it. Date engravings obscured in Photoshop for our client’s privacy. 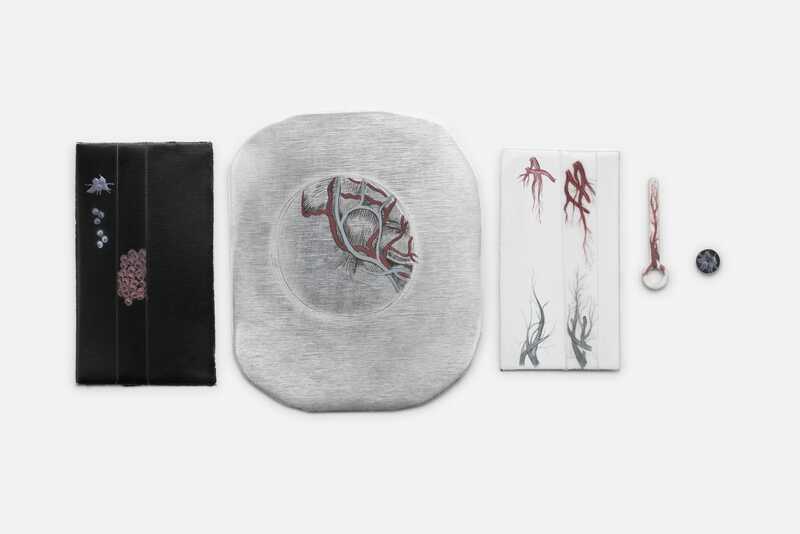 Also on his wish list was the engraving of several personal dates, as well as a visual concept, which included representations of red and white blood cells, platelets, as well as arteries, veins, and bone marrow, but one that should not look gaudy. We knew that we had to use the possibilities offered by Ludwig Oechslin’s open design concept to their fullest in order to succeed in creating a watch with a perfect balance between elegance and symbolism. 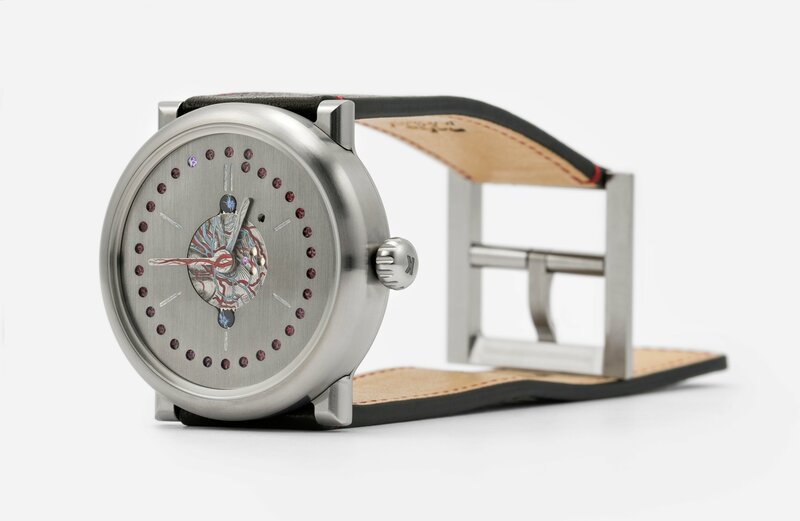 The desired design elements were to be placed “logically” on the watch and should not be apparent at first glance. We will manufacture your bespoke ochs und junior based on the perpetual calendar invented and designed by Ludwig Oechslin. The target is a contemporary timepiece that is highly functional and excellent to use for business, your regular 15-minute meetings, and your board meetings. It should also be a timepiece you can wear everyday including in your private life with your family, and a third requirement is that it be a highly personal watch. 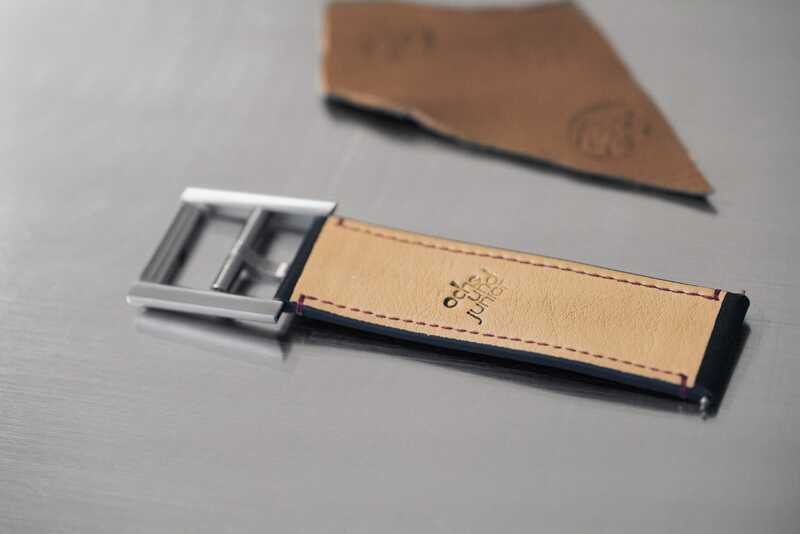 The base material for this elegant and useful watch will be titanium (case, crown, buckle). The hands and markers will be visible at night and will also offer excellent readability during the day. To achieve this, the dial would have a dark base, and the hands and markers would be in a light color. 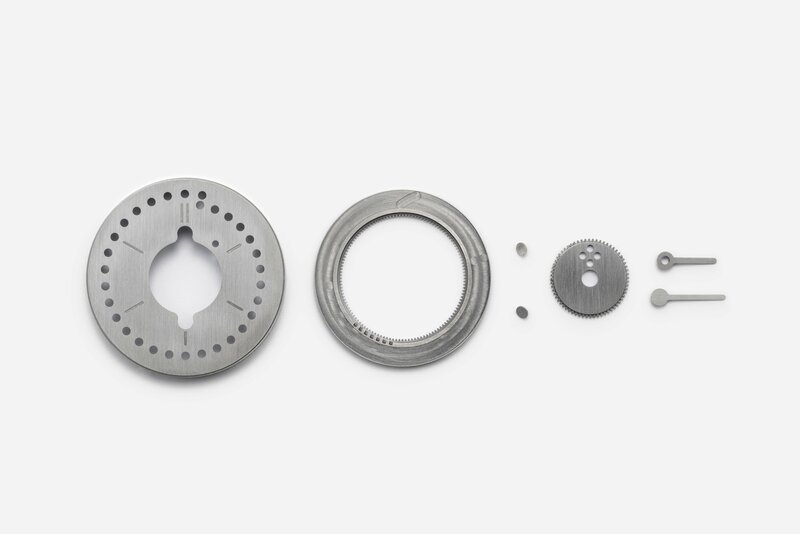 The solution will include paint (Super-LumiNova) and also elements of raw machined metal. Up front, we want to declare that one of these ideas, night-visible hands and markers, is not compatible with the detailed painting work we are proposing in this first concept for your hands and markers. If you would like to have night-visible hands and markers, these would need to be a solid color (drawing / painting with Super-LumiNova will not work). Just let us know if this is the direction you would prefer. 1. The material: As you know, titanium is a material used for medical implants including hip replacements. It is also perhaps the most functional material for watches. We would propose that not only the crown, case and buckle for your bespoke watch be manufactured in titanium, but also the dial, hands and disks. 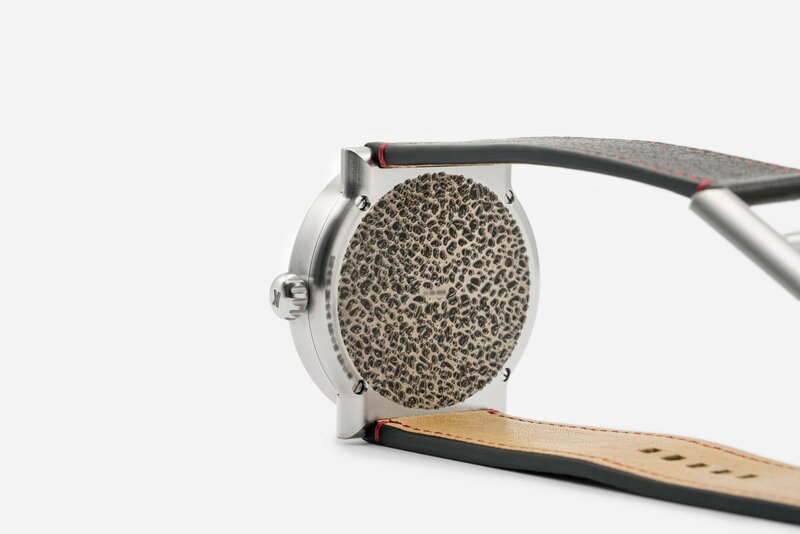 The only visible metal on your bespoke timepiece would be titanium. 2. Two levels: We could imagine creating a highly-functional piece, and yet a highly personal piece, by making a second level of detail visible exclusively with a watchmaker’s loupe. For this proposal, we would manufacture a custom titanium watchmaker’s loupe and elegant hand-made pouch that is matched to your timepiece. 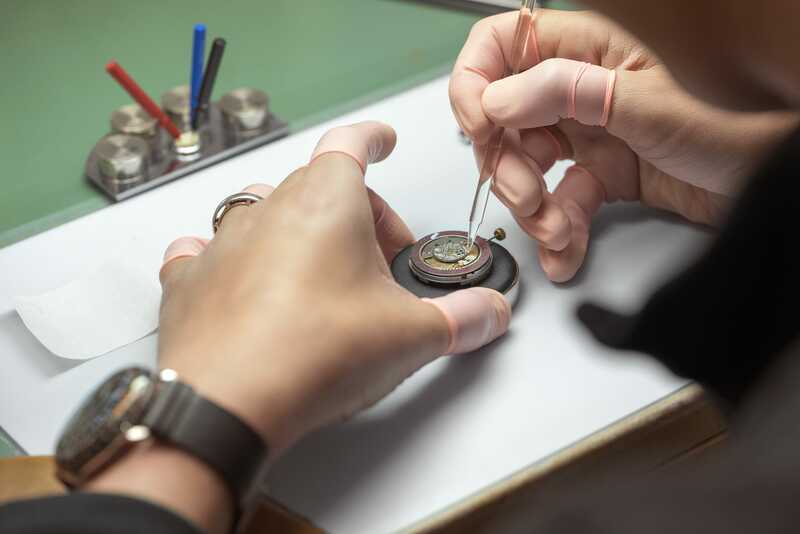 Through this loupe, a second level of detail for your bespoke watch would be revealed. This would be a level of the design for sharing at intimate gatherings in your home or private office – not just with mere acquaintances at a random meeting. 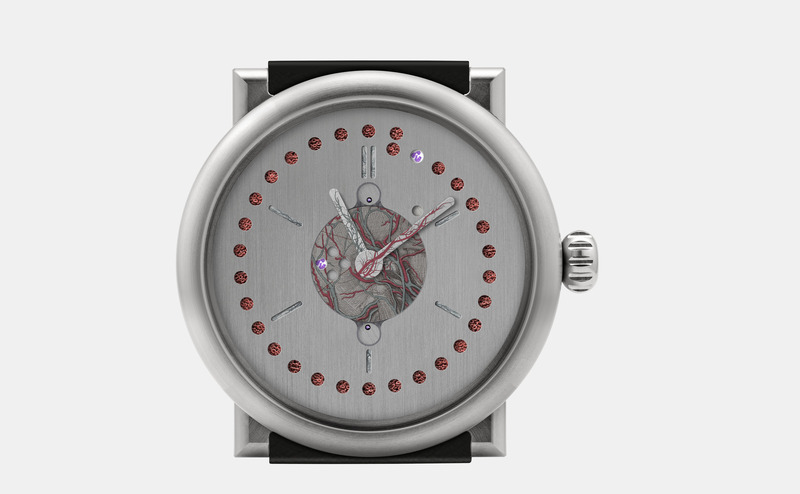 We think this makes good sense, since many of the things you would like represented on your watch (blood vessels, red blood cells, white blood cells) are only visible under a microscope. To have them visible with the naked eye, to us, would not be a sensitive-enough interpretation of the inspiration you have provided us. 3. The hands and markers: we think the hands could either feature laser-engraved blood vessels, or hand-painted blood vessels. The exact color could of course be determined by you. With the naked eye, contrast would be apparent. With the loupe, a next level of detail, that these are representations of blood vessels, would come into clearly into view. 4. The dots: we could imagine the perforations featuring hand-drawings of red blood cells. Since white blood cells are far less common in blood than red, the date and the month dots could be represented by white blood cells, while the more common red blood cells could fill the other perforations. 5. 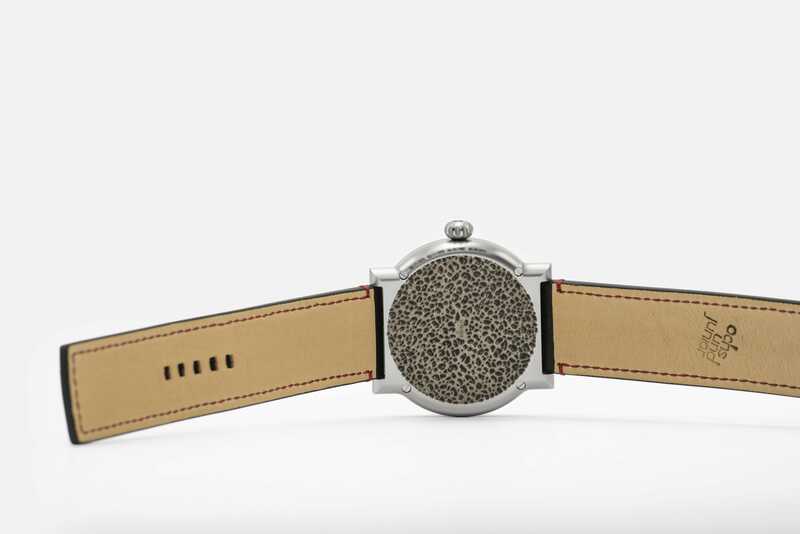 The engraving: the case back of your perpetual calendar could feature a 3D-engraving of bone marrow. This would be a special process, similar to what we used for Ming Thein’s watch. Your case back would first be milled, then precision-etched with a laser, which would allow us to incorporate color gradations from almost white to black, with several shades of gray in-between. This pattern would be recognizable with the naked eye, without the loupe, since it is being made at something more similar to the actual scale of actual bone marrow than the other inspirational elements. 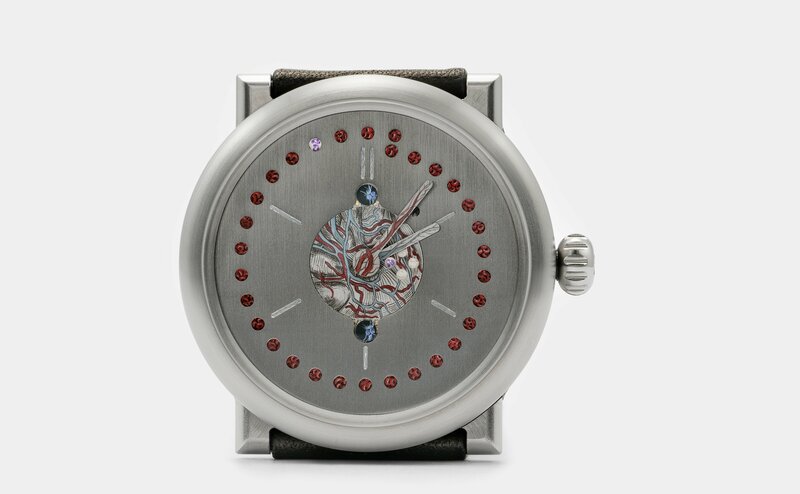 Our thought was to incorporate your 5 dates in the following way: the 4 significant birthdays on the 4 pillars of the watch (the lugs) and the date which represents the bone marrow transplant in the center, since the back would be executed in a bone marrow design. This would also not require you to make any of these birthdays more significant than the others with the design. The font we are using is Helvetica Neue, the Swiss-designed font we use in all of our communications, but you could of course also have a personally-selected font instead. 6. An alternative concept: If you would prefer a more elaborate painting on your dial, our Photoshop expert Andy Jossi has designed a second possibility. All further details for your watch, such as your strap, could be discussed after these big, direction-level questions have been answered. It was clear from the beginning that for this project, we would have to find the as of yet unknown solutions to existing questions and to questions that would come up along the way during the work process. Whenever creative ideas are being implemented, new paths and methods have to be discovered. And some of these paths and methods have to be tested to know if they really represent possibilities. 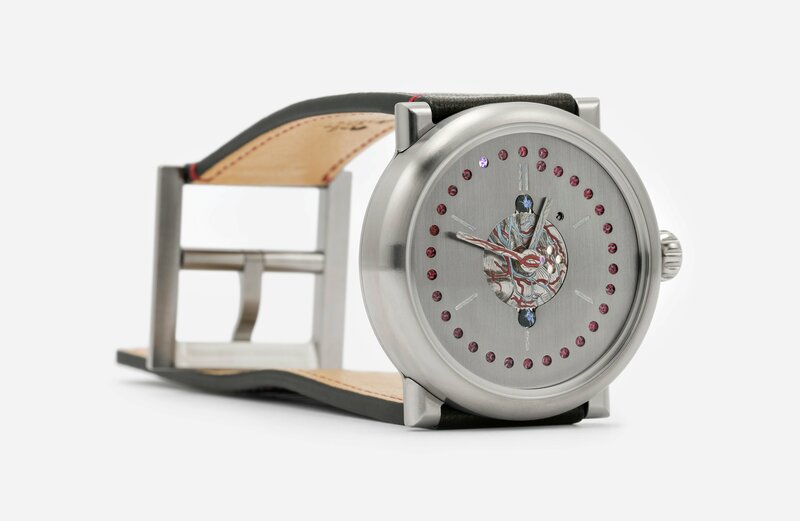 At the outset, we were not yet sure how to turn the design created using Photoshop into a real watch. We thought about printing the desired patterns onto the parts, but that solution seemed neither unique enough nor to truly add value. At an internal project meeting, our master watchmaker Marion Müller suggested working with Bernadette Sommer. Bernadette Sommer is an artist working in Willisau, a small town near Lucerne, restoring valuable vintage dials of pocket and wrist watches for Patek Philippe or Omega, among others. She also realizes microscopic patterns and paintings on dials and on porcelain. Her commitment and her confidence that she would succeed in delivering what we needed were soon backed by a first series of trials that Sommer made for us – which we then sent as a high-resolution photo to our client in San Francisco for approval. Dial: tiny veins were painted on the indices. To allow better access with the brush, the milling depth for the indices was reduced to 0.1mm. Date disc: To compensate for the coat of color applied by hand to paint the red blood cells, the date disc was milled deeper by 0.3mm over its entire surface. Only at the inside as well as at the outside of the radius, a small edge was left. Leap year wheel: To ensure that there was enough space to paint the white blood cell on the leap year dot, the recess was milled 0.1mm deeper. In December 2017, once Helfenstein Mechanik AG had completed their work on all parts for the perpetual calendar, and after the final design had been approved by our client, the detail work began. Usually, we can tell fairly exactly what the delivery date for a bespoke watch will be. Though of course, there is always the possibility of unexpected delays, for example if a colored dial is scratched during the assembly of the watch or if a tiny screw thread strips because a microscopic metal splinter has not been removed before the 0.25mm screw is screwed in. If these watches were part of a series, our watchmaker could just reach for the next part or the next dial to replace the damaged one. In the case of individually manufactured pieces, this is not possible. For these watches, we manufacture only the exact parts that we need and work with utmost care and concentration when assembling them. It is a craft executed in the smallest space; mistakes are immediately visible. And something can always happen. This watch, however, was to be even more special! Our client from San Francisco also took up our offer to let him assemble his perpetual calendar himself. Since his time window was narrow, we planned for a two-day visit at the end of March 2018. This meant that, before his visit, we had to assemble the complete watch without the painted details to test it over several days and adjust the parts. Then we had to take it apart, add the finishing details, assemble it once again and test it over several days, only to carefully take it apart once more, avoiding any damage to the parts and storing them for the big day of the final assembly. Delivering a complex wristwatch on schedule, with an appropriate safety margin, is only possible by drawing on a great deal of experience. We know how to handle the functions of the perpetual calendar. We did know precisely how the painted details would affect the heights. For that reason, Bernadette Sommer began working on the most delicate part in terms of height changes, the date disc, painting about a fourth of the disc. We then wanted to assemble the watch with all parts to discover any negative effects before the work had advanced too far. In order to keep the process efficient, we picked up the valuable components in Willisau, brought them to Lucerne for testing, and drove them back to Willisau 20 hours later. Everything fit! The paint work could continue, with the goal of finishing it by mid-February. At the same time, the Birchler Gravuren und Lasertechnik AG in Neuheim engraved the titanium case back and, a novelty for an ochs und junior watch, the crown. 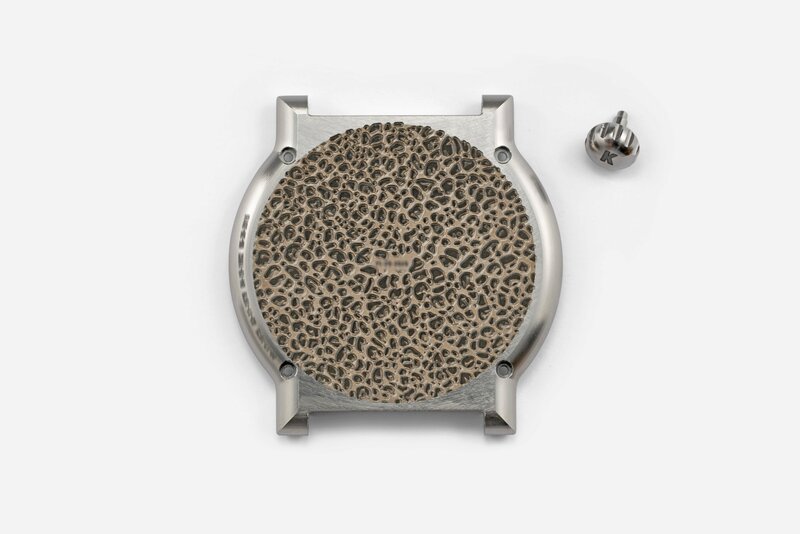 The design showing the structure of the bone marrow was first milled into the metal and then processed, using laser technology, to show different shades of gray and black. The result is impressive! 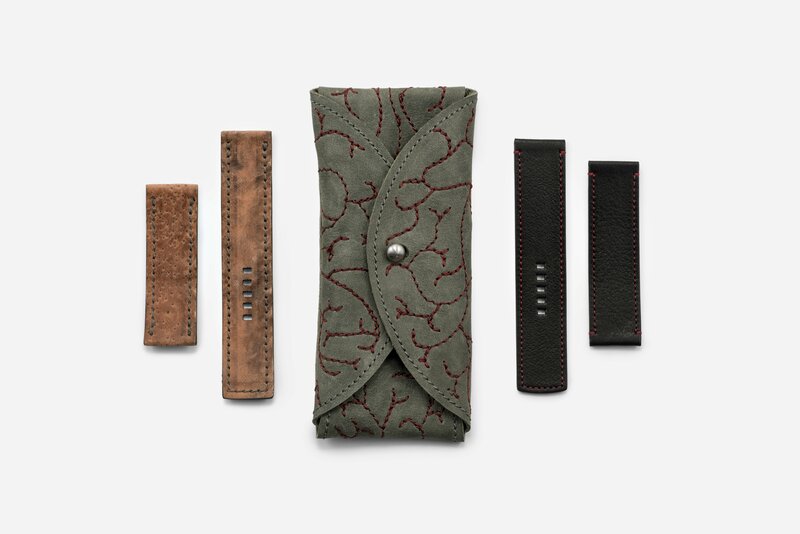 Sabina Brägger, our expert for textiles, designed and sewed the pouch from vegetable-tanned Ecopell leather. The dark red seams symbolize the arteries, which have also been painted onto the month disc and the minute hand of the watch. 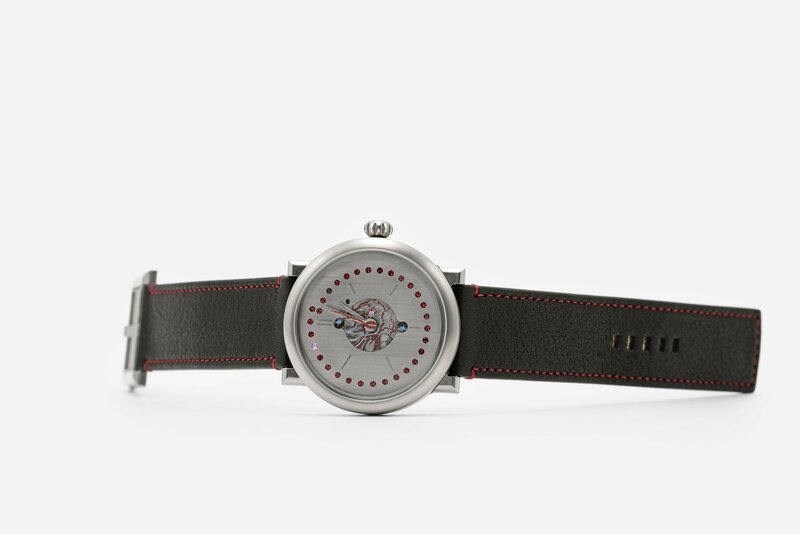 The sturgeon leather strap features silver seams, and for the second, black strap she used red thread again. By mid-February, Bernadette Sommer delivered the finished parts to Lucerne. We were stunned. The similarity to Andy Jossi’s Photoshop mockup was impressive! From the beginning, our watchmaker Sandra Flück was in charge of building this watch, and with her calm, sure hands and considerate movements (which can be admired in this video), she went about assembling the watch with the painted parts. Only for the hands we still used brass stand-ins in order to preserve the finished titanium pieces and avoid any damage that might result from inserting them and taking them back off. The end of March was approaching and so was the visit by the client and his wife to Central Switzerland. We personally presented hotel and restaurant tips in addition to those on our website and suggested further holiday activities. As far as I was concerned, all eventualities had to be provided for by February 22, since I was leaving for a 6-week break and had agreed with the client that I would not interrupt my vacation for his stay. The watch was assembled on March 27 and 28 by the client himself, under the supervision and with the assistance of Sandra Flück. Cail and Ludwig acted as the hosts. They later told me about the smile on the client’s lips when he left our workshop. This watch is the most elaborate piece that we have realized with ochs und junior to date. Thanks to the team work and the commitment of each of the people involved, it turned into a piece of art – but one that is highly functional. Cail’s photos have provided me with proof that the project was a success – proof that I needed because this is the only ochs und junior watch ever delivered that I have not personally held in my hands once it was finished (due to my leave). A strange feeling; a very special watch. Our thanks go to our Californian client for this unique order, his faith in us, and his enthusiasm. We now have reached a next level of customization and are looking forward to what might come next. The price for a bespoke watch at this level is based upon an individual quotation. Partial payment at the start of the project.